Heavy Duty Dog Crate fans are a necessity when transporting dogs in hot weather. 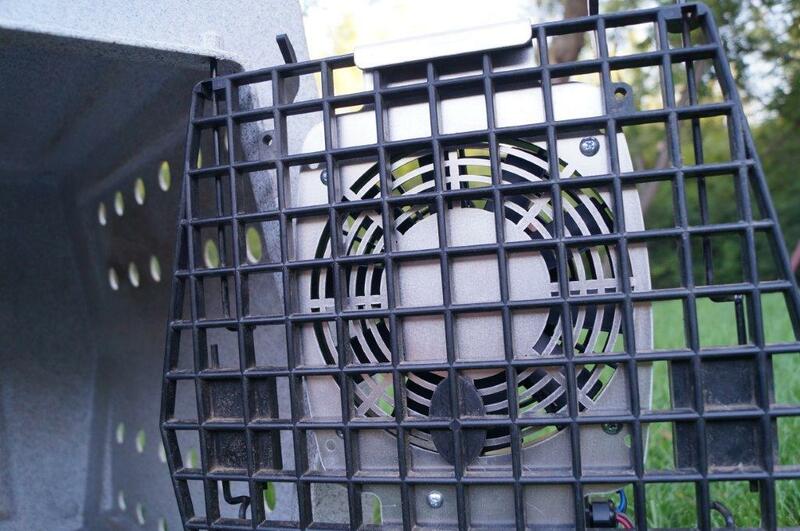 A great kennel fan is the heart of any crate cooling system. 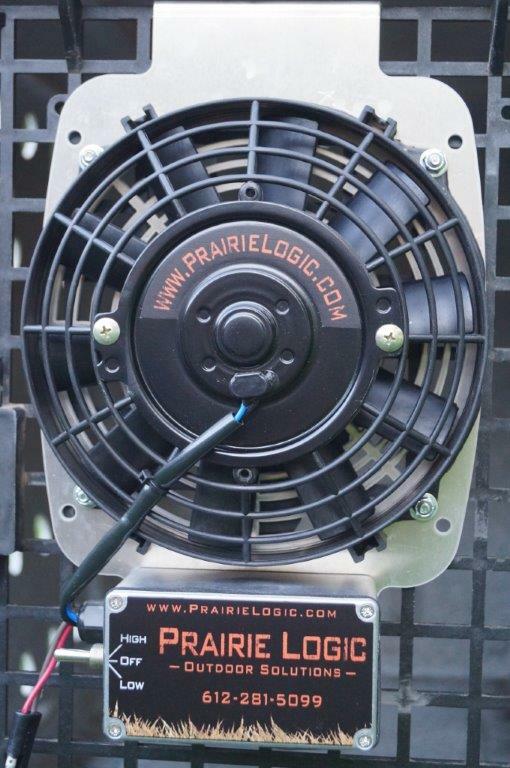 Prairie Logic kennel fans run with energy supplied by your vehicle’s battery. It draws less than 2 Amps on the Low setting. You can let your kennel fan run all day with the motor off. Your battery will be there ready to go when you are. There is no substitute for a great dog kennel cooling fan when your dogs are panting in their kennels during hot spring and summer weather. You want to know that when you’re not there, the Prairie Logic fan is working to keep your dogs safe and cool. We all want our dogs and your dogs safe, healthy and happy. NOTE: 7" fans come with a single 8" cigarette lighter cord. We know how valuable your dogs are to you. We are dog owners too. That’s why we’ve developed a tough kennel cooling fan that delivers 2 speeds delivering continuously to keep your dogs safe and cool. These great kennel fans are made to run when the engine is turned off. Amperage draw information is shown below. This means that in the back of your SUV or your pickup, these field tested tough kennel fans keep your hard working dogs safe and cool. *If ordering more than 5 kennels fans, please CONTACT US for special shipping arrangements. Running either of these first quality safety tested kennel fans on Low has a power draw from your battery that's less than 2 AMPS! This means you can leave your fan on with your vehicle engine off all day without worry about a *dead battery. attach it to the back, or in some cases, the top of the crate. 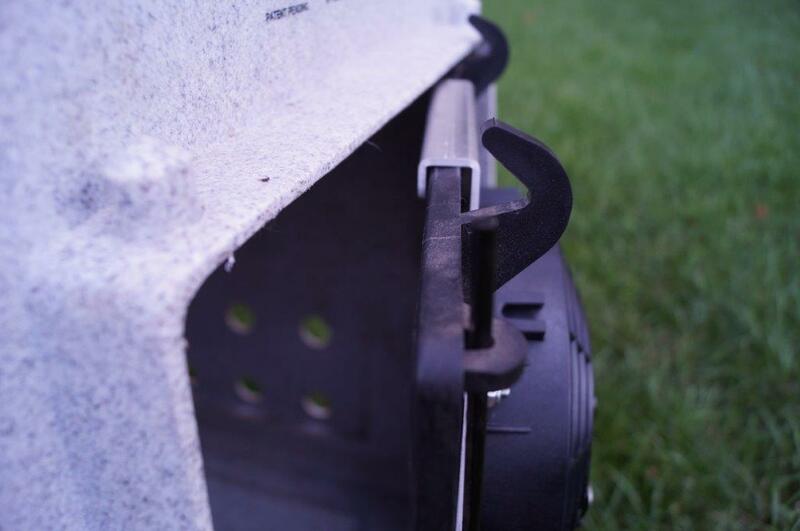 You may also use the metal fan bracket to hang the fan on the kennel door. A fan bracket is included with each fan. It's great to have options! The typical installation method is the door installation using the fan bracket or, you may have a crate setup in your vehicle where permanent installation works best. When it comes to keeping your dogs comfortable in hot weather there is no substitute for a top quality kennel fan. 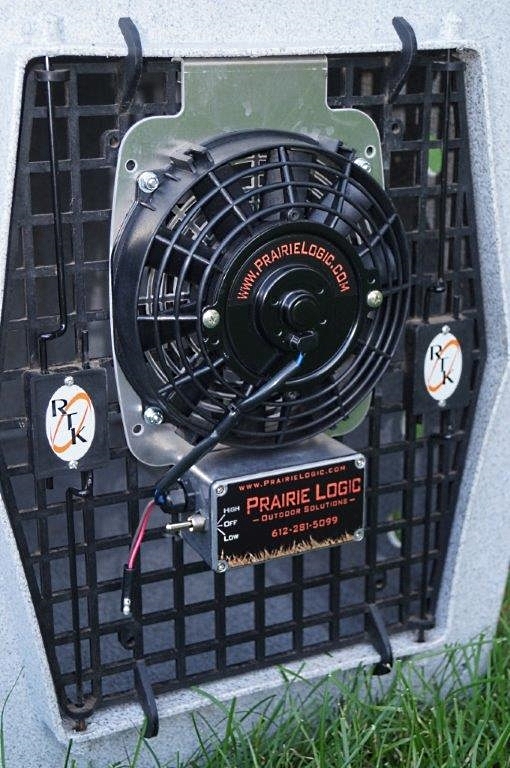 In addition to keeping your dogs cool, consider some other benefits the Prairie Logic kennel fan provides. *Keep in mind that battery age and condition of the fan play a role here. 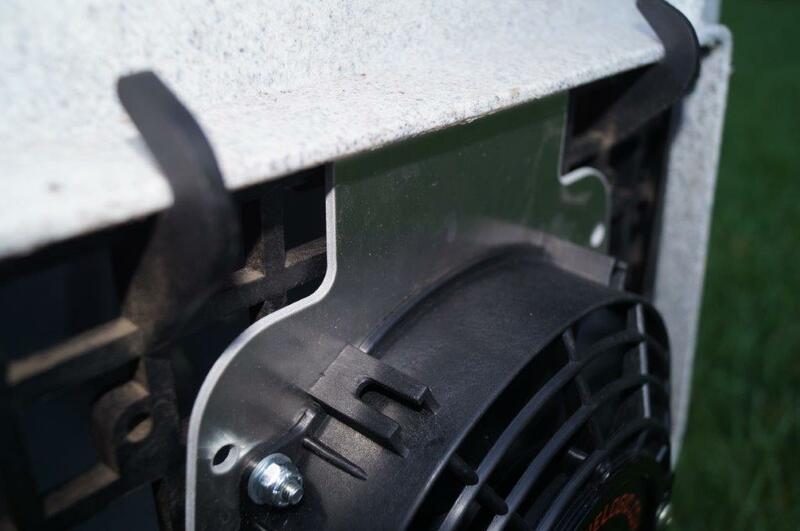 Vehicle battery should be in good condition for continuous operation of the kennel fan. When using the cigarette lighter adapter, make sure you have a solid connection. Please verify the dimensions of your kennel door prior to purchase. I think you will agree that it is best to order your kennel fan accessories when you order your fan both for convenience and for savings on shipping costs. If, at a later date, you need any of the kennel fan accessories shown below, just click on the highlighted links and you will be taken to a page where you can place your order and get quick 24 hour shipping. make the connection to a trailer at the same time. 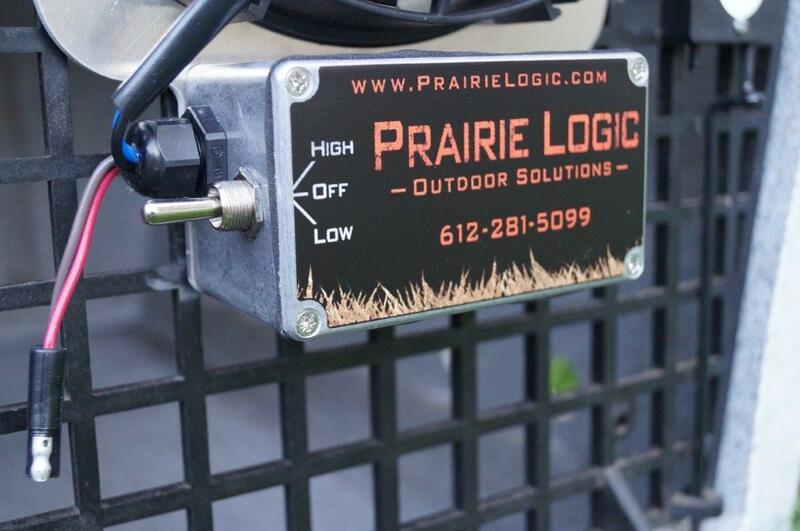 When using the 7 pin round connector with Prairie Logic kennel fans there must be auxiliary power supplied to the vehicle socket on the back of your vehicle. Not all vehicles come with live 12-volt power supplied to the connector. You can test this with a volt ohm meter or a test light by going from the auxiliary to the ground terminals. On some vehicles the key must be turned on to supply power. If there is no power supplied to the plug, check your owner's manual or contact your dealer. Cigarette Lighter Power Cord 8 Ft. This is a standard 8' cigarette lighter power cord just like the one that comes with your kennel fan. This back-up cord is handy if you carry your dog in a 2nd vehicle. Just plug in and go, quick and easy. It can it can also be used as a back-up cord or as a replacement for a lost or damaged cord. events or to the field on hunting trips. Use the double cigarette light power cord when you need to run 2 fans at once. It just makes good sense when you need to keep more than one dog safe and cool. While these fans have a low amperage draw from your vehicle battery, running 2 fans at once will double the amperage draw. Just a point of knowledge and something to keep in mind. This is a dependable way to cool two dogs at the same time. It doesn't get any easier than this! This is a standard power supply with female adapter for a "cigarette-style" charger. It converts AC from your wall socket to 12V DC. This handy item provides a way to run your kennel fan at home, on vacation or anywhere outside your vehicle. When you need it, there's no substitute. Great item to have onboard. There are some vehicles that are too long for the standard 8 ft. power cord that comes with your kennel fan. These might be Suburban style vehicles or perhaps a longer pickup truck. In any case, use the power extension cord to reach from the cigarette lighter to the kennel located in the back of the vehicle. When you need the extra length, there's no substitute for our power cord extension. Keep your special canine friends cool. They need it and, they deserve it. One click - Add To Cart now!